Summer is almost over Sale! It’s hard to believe that summer is almost over. My son starts back to school on Tuesday, that’s crazy. I love the freedom of summer, but I love the crisp air of Fall and the smell of fireplace smoke, boiled peanuts, pumpkin flavored everything, the beautiful leaves, well everything about Fall. Since Summer is almost over, I want to have a little sale on my books. My ebooks will be on sale on Amazon and my paperbacks will be on sale on my website. My Amazon page is at http://www.amazon.com/Stephanie-Hurt/e/B00850W7U8 and my new author website is at http://www.stephaniehurtauthor.com. The sales will go up tonight, should be available late today. Also, Horseshoe Publishing which is the publishing service I jointly own with my editor/cover designer/awesome assistant will be offering discounts on our services. We’ve added website design and setup to our services. My new website is one of our creations. All of my covers are designed through our service. Hope everyone is enjoying this day and smiling. A smile gives you joy and helps to set up the day as a positive one. It’s Monday morning and I definitely feel it. My weekend was a tiring adventure. We spent all day Saturday erecting the new play fort for the Children’s Ministry. Of course it was the hottest day in Georgia this summer. Let’s just say the water and gatorade was flowing. But after many hours of hot, sweaty, mind boggling instructions, we finished it. It looks great and the kids came in yesterday with huge smiles. That made it so worth it. In my writing career I’ve been honored by a couple of magazines letting me write articles for them. I’ve been honored again by Southern Writer’s Magazine. I’m working on an article for their Nov/Dec issue and it’s going to be an instructional article. If you don’t subscribe to their magazine then you’re missing out. The magazine has some really good articles and their dedication to helping authors is amazing. They’ve been really supportive to this southern writer and I’m honored to help them with their magazine. So as I sip my coffee adoringly this morning I’m thinking of the work at hand. Thursday I purchased the program Dragon Speak to help me with my rough drafts. If any of you have used this program then you know the frustration I had at first, but as I sat down last night determined to make it work, it just did. I just have to get used to talking instead of typing. I’m hoping it will help with the sore shoulders and neck from many days typing. I’ll keep you updated on how that works. As for deadlines and upcoming books, Emma Rose is coming along well. I’m working on setting a deadline for it. I spent most of last week with my wonderful editor/partner/cover designer creating back covers for some of the books that have been out in Ebook edition, but not in paperback. The covers came out really well and I’m excited about their release. My new website is up and running at stephaniehurtauthor.com, so if you get a change click over and let me know what you think. The publishing company I own with my partner, Horseshoe Publishing, is now creating websites. The possibilities are endless so if you’re looking for a creative website to showcase your work, just give us a shout. As you can tell, my life has been busy, busy, busy the last couple of weeks. That’s why I’ve been a little away from my posts. But starting September 1st you’ll hear from me everyday of September. It’s time for Romancing September Across the World Blog Tour with my friend Rosie Amber. We have a awesome list of authors this year and I can’t wait to get it started. We’ve been working hard for two months getting the info from the authors and getting the posts set up and ready to go. Keep a watch out and help us get the word out each day. So, sitting here writing this is keeping me from the work at hand. I could talk with you guys all morning, but Emma Rose is crying out to have another chapter under her belt. Pacing the quarters that were quickly shrinking, she finally walked over to the door. She placed her ear on the door to see if anyone was near. When she heard nothing, she quietly opened the door. Slowly she stepped out of the cabin. The sea air felt wonderful on her face. Closing her eyes she let it blow over her body and through her hair. The smell was heavenly and made her long to be up on deck. She leaned over the railing and looked down at the water rippling and splashing on the side of the huge ship. So caught up in her view, she didn’t hear Caleb coming up the walkway. He couldn’t believe she was already disobeying him. She was caught off guard when he pulled her quickly into his quarters. The anger in his eyes told her that this would cost her freedom. “I’m sorry, but I just can’t stay cooped up in here. It’s stuffy and warm.” She indicated the sweat on her brow. He walked over to the door and contemplated what to do with this woman. She’d disobeyed his orders. What if his men would’ve seen her? Rolling his eyes he turned to look down at her. “If you’ll stay in here until after the men go to sleep, I’ll take you up on deck.” He put his hands on his hips. “Can you handle that?” What was she doing to his control? She meekly looked up at him from under her lowered lashes. “I’ll stay right here.” She was excited about going up on deck to see the stars overhead. They were always brighter out at sea. “I’ll be back in a bit with dinner, so you’d better be right here. Do you understand?” He talked to her as if she was a child. “I’m not a child.” She huffed out. “Then don’t make me treat you like one.” He said and walked back out the door. By the time he stepped back on deck he was smiling. Things were not going to get boring with her on board. He whistled as he stepped up to take the wheel from Tom. Caleb cut a hard look at him. “She’s not a prisoner and she’s the most stubborn woman I’ve ever dealt with.” He growled out. That was just a little dangling bait to wet your senses. It’s a powerful book that takes you on a journey across the sea and back. Don’t forget, it’s coming Friday! New Website and Release date finalized! It’s been a very productive past couple of days. I have a new website that features buy links for my paperbacks and it’s pretty neat. 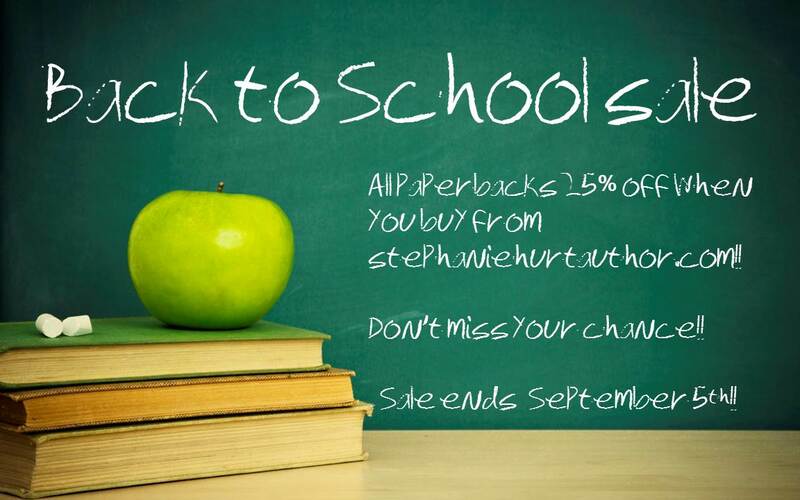 You can go over and visit at http://www.stephaniehurtauthor.com/. Also this is something that Horseshoe Publishing does. We offer website design and set up. Also at competitive rates. Just wanted to throw that in there. 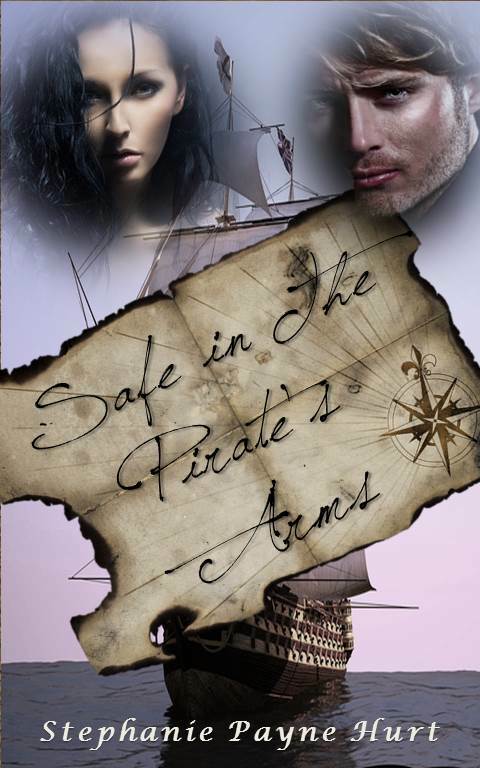 The other big news is that “Safe In The Pirate’s Arms” official release date is Friday, August 15th. Yep that’s this Friday. I’m excited that it’s so soon, I’d thought it might me next week. Of course my new website has a countdown to the minute, but you know how these book sites are. It could go up a little earlier, but that’s the approximate time. I hope everyone is having an awesome week so far. As for me, it’s been great and I’m working on Emma. The countdown to release is coming up. Then on to the new series. Yikes, deadlines! Yep, I love being a writer.